READ COMMENTS/ FEEDBACK FROM USERS OF BIO CLEAR 810 - detailed info - a must read if you are considering Bar Top Option 1 using Bio Clear 810 epoxy - CLICK . -- Also available with a slightly thinner, summer curing agent which allows more working time to remove any bubbles, more time for leveling, etc. (also takes longer to get hard). This is Basic No Blush Epoxy - Summer cure. Use this slower formulation on penny floors "Hey Paul -- ,The summer cure is awesome! Self leveled much better than the standard no blush and no real issues with bubbles! I greatly appreciate your patience with my questions." NO ONE ELSE OFFERS A SLOW SET CLEAR EPOXY COATING FOR MAXIMUM WORK TIME BEFORE IT STARTS TO GEL/HARDEN. APPLY MULTIPLE COATS TO ACHIEVE ANY THICKNESS YOU WANT. READ COMMENTS/ FEEDBACK FROM USERS OF BIO CLEAR 810 - CLICK . 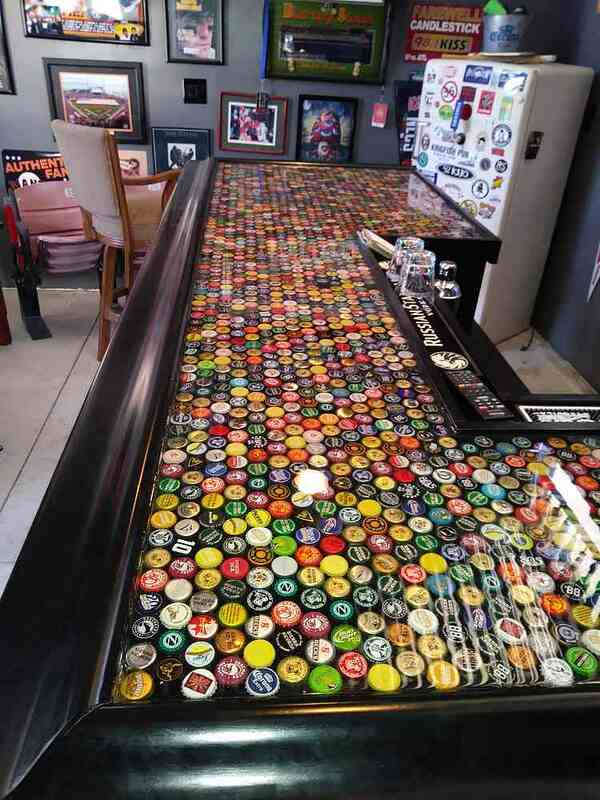 This is a good example of why you want to use only a cyclo-aliphatic epoxy for your bar top. The other clear epoxies sold for table tops suffer from bad (excessive?) yellowing (and I bet they don't even mention it on their web sites). Don't be like the first contractor that just poured some cheap clear epoxy over the airport logo and thought they did a good job. It looked fine to start with and the contractor made a few extra dollars using generic clear epoxy. Too bad. The airport was lucky they could redo their badly damaged cheap epoxy mistake. 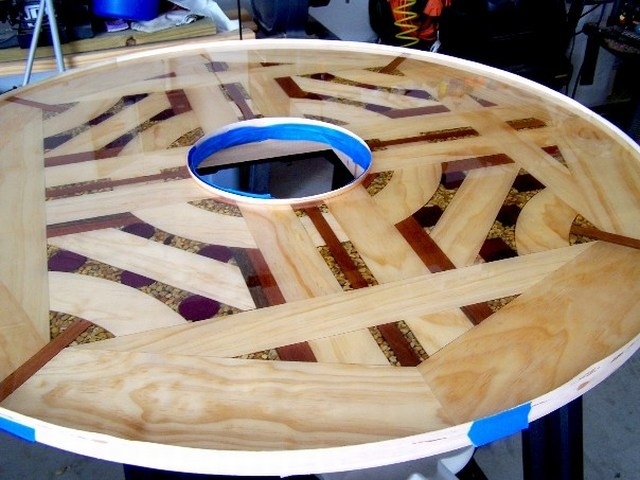 Most folks cannot redo their special poured epoxy table top. NOTE: Because of the yellowing, it is generally not a good idea to have a poured epoxy table / bar outside in the sun, but if you do - use our cycloaliphatic epoxy and keep it covered when not in use. Largest Pour with this epoxy 1156 square feet. As I write this I am working on a 27 gallon order for a Brewery in the Mid West. This is their second order. You don't find these kinds of commercial epoxy pour projects with the 'craft epoxies' offered on the other web sites. Cycloaliphatics epoxy systems generally cost about 25% more then ordinary epoxies. In many applications they are not necessary. But they certainly are for clear table tops and bar tops. IF THE OTHER GUY'S EPOXY WAS A CYCLO-APHATIC EPOXY - YOU WOULD KNOW ABOUT IT. Skip it all and get answers fast (or just talk about your idea). Email us for help or questions about your epoxy pour project or the Bar Top epoxy resins. Leave a number and the best time to call if you want a one on one conversation. That's business the old fashion way! The reduced very slow yellowing of Bio Clear 810 is a major reason why you should use Bio Clear 810 table top - bar top epoxy and why it costs a little bit more than some of the competitor's so called bar top epoxy. Use Bio Clear 810 (and not the other brands) especially in outdoor settings. (keep covered when not in use). The primary reason why Bio Clear 810 is so superior to any of its competitors is that it uses cyclo-aliphatic resin systems with superior weathering (UV) properties - which include low yellowing. We do sell a 2 part poly (acrylic poly uv plus (tm) with max UV protection, but unless skilled at spraying 2 part coatings, you'll be better off with just the very clear 810 and no rolled or brushed top coat over it. 6) honest and complete info (pro and con) on this site. You get the FULL story. 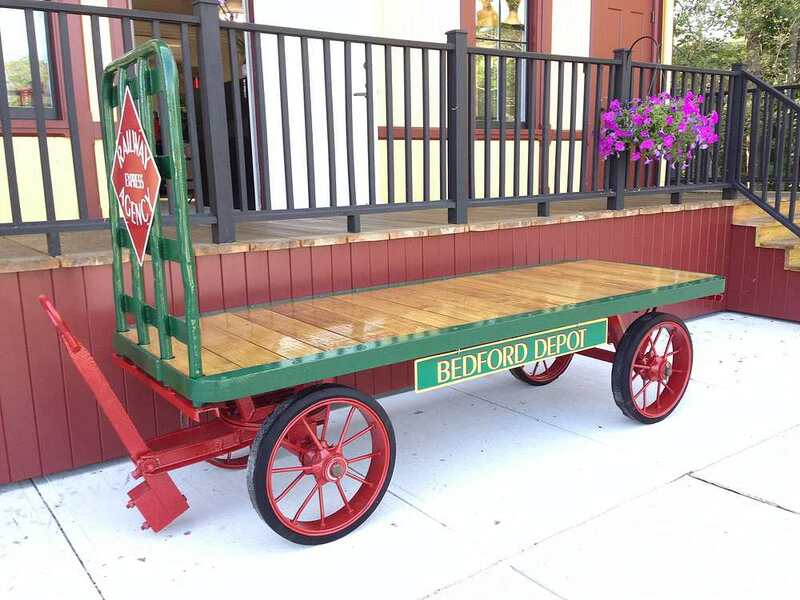 9) a favorite with both experienced professionals and 1st time DIY individuals. See the pictures and comments from our regular (repeat business) commercial users on this web page. The PROs have tested many products and could make a larger profit with cheaper epoxies, but with their reputation on the line (and the need for bubble free results) they only use Bio Clear 810 epoxy. Examples of regular, commercial users on other (much slicker) pour-on epoxy web sites is scant at best. There is a reason for that! 10) we appreciate your interest and thank you sincerely for your business! "Love the product (Bio Clear 810) these past six years I've been using it." To start we glued black formica to the counter top 3/4" plywood base and built a 5/16" plywood strip dam around it. The release agent was waxed paper and was placed between the dam and the plywood countertop base then run up and over the dam. Everything was taped in place to include the bottom seam between the dam and the base. The dam was attached with screws and was pretty tight. This was done on a boat so we had to level the whole thing. We placed glass flat stones, which were a uniform 3/8" in height, all over the formica and poured the Bio Clear to the top of the dam. My wife wanted a little relief with the top of the stones showing so we poured until we got the effect she wanted. We found we needed an aluminum yard stick to spread the resin over the top of the rocks because the resin tended to flow up the rocks but not all of the way over them. The Bio Clear flowed out nicely with no trapped bubbles or any other problems. The few bubbles we had were very small and worked their own way out. I think a nice steady slow pour was also one of the reasons we didn't get many bubbles. The room temperature was a consistent 72 degrees. We ended up using less than the gallon of Bio Clear - probably about three quarts. The counter top is 8' by 22". Frankly we were amazed and surprised that the project turned out so well. I think the key to our success was following the very complete instructions and tips on your website and taking our time to make sure everything was set up correctly. As I remember you already do this but put a lot of emphasis on following the instructions exactly, reading all of the information on your website and to taking the time to preparing everything very carefully. When the bathroom is finished I'll send you some photos. 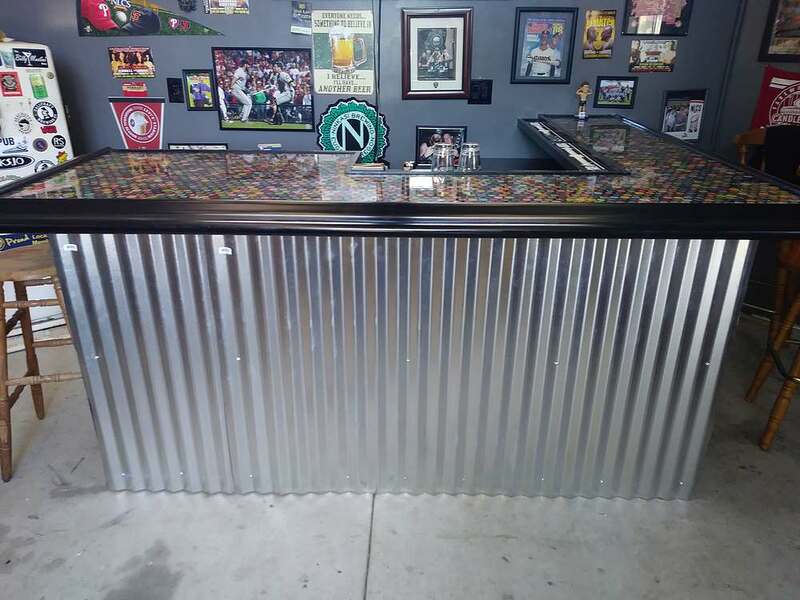 mix of DIY homeowner projects and Professional bars. * All epoxies yellow in sunlight and even over time. Note that our table top epoxy, Bio Clear 810 (tm) has very slow, reduced yellowing. A commercial epoxy pour contractor recently used our Bio Clear 810 to replace a badly yellowed epoxy covered logo in the INSIDE floor of regional airport terminal with our 'almost no yellowing' Bio Clear 810 (cyclo-aliphatic epoxies to the rescue!) This is a good example of why you want to use only a cyclo-aliphatic epoxy for your bar top. The other clear epoxies sold for table tops suffer from bad (excessive?) yellowing (and I bet they don't even mention it on their web sites). Because of the yellowing, it is generally not a good idea to have a poured epoxy table / bar outside in the sun, but if you do - use our cycloaliphatic epoxy and keep it covered with not in use. mix quickly, double mix, work in as cool conditions as you can. * Case studies and customer postings - keep reading! One contractor/customer was hired to do a poured epoxy floor in the Hawaii based recording studio of a retired famous rock star with our Bio Clear 810 epoxy (plus lots of commercial bar tops and airport terminal logo floors). All we can add is that most of our commercial contractor Bio Clear 810 customers started out with other epoxy brands and shifted over to us. You will not find anything like our User Feedback page on any other web site! It is extensive and includes, email questions, problems, comments from our customers. 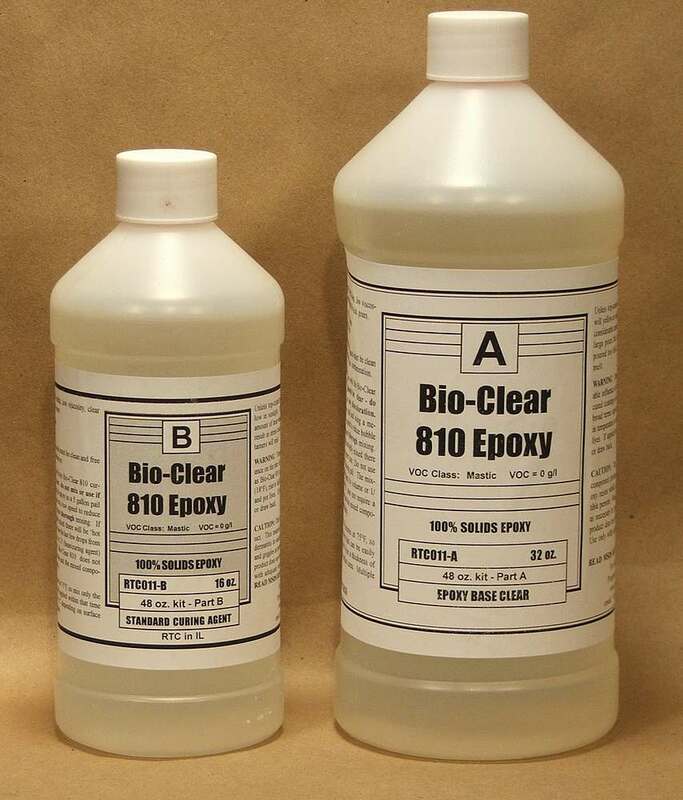 Scroll down to the Bio Clear 810 section on our feedback page -- www.epoxyproducts.com/usernotes.html . This is the product used by professional and DIY home folks (see the pictures below). Bio Clear 810 is not the 'consumer' grade stuff found in hobby shops and slick sales based web site. It is formulated and sold to epoxy professionals. It has been formulated for the least amount of epoxy "uv yellowing" of any table top epoxy and the only cyclo-aliphatic table top epoxy in the market. more bar top table top examples --- www.epoxyproducts.com/bartop2.html . Largest single Bio Clear 810 Table top epoxy one time Epoxy Pour - 1156 square feet (maybe an all time epoxy record? You cannot do this with just any clear epoxy). 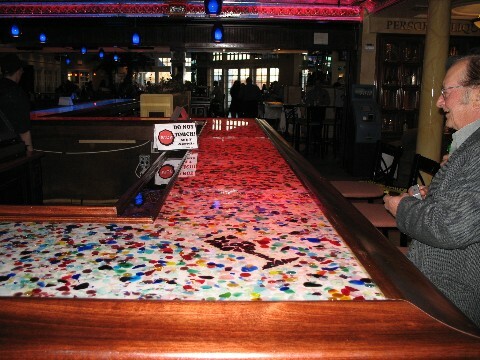 Hire the contractor that did this huge pour for your commercial Bar Top epoxy pour. See the white contractor box about 1/2 way down this page for details. With over $10k worth of epoxy and $10k plus worth of labor, hotels, airfares, shipping, (to Hawaii) meals etc. all on 'one roll of the dice' you don't gamble on the epoxy - only the best will do. Ohio based John Martin of Epoxy Concepts has travelled the country pouring Bio Clear 810 epoxy on commercial projects. His largest project, probably a record setter in poured epoxy projects, was a 34 ft by 34 ft (1156 squ feet) recording studio floor. With the help of 6 assistants Mr. Martin tinted the epoxy blue, added metal flakes to make the poured epoxy sparkle, and poured out over 200 gallons of Bio Clear 810 epoxy. 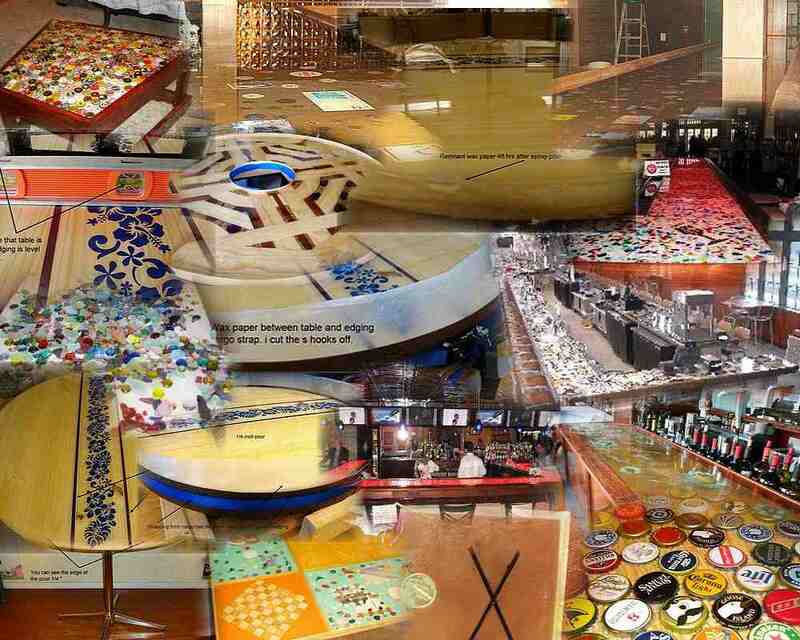 More common projects for Mr. Martin are commercial bars (may of the bar pictures here are Mr. Martin projects). As the owners tell me, "All the money is made within ten feet of the bar," so the bar gets top billing. Generally it takes about 20 gallons of Bio Clear 810 for commercial bar surface. Sets of table tops for restaurants are also common projects. Your project might not be 1156 square feet, but use an professional epoxy that can handle such a huge pour successfully. Bio Clear 810 has a track record and following in the professional marketplace. 1 gallon of anything applied 1/4 inch thick will only cover slightly less than 6.2 square feet. 1 gallon of anything applied 1 inch thick will only cover 1.6 square feet. At 1/2 inch thick that gallon of epoxy will only cover about 3.2 square feet. There 231 cubic inches in a gallon. One square foot is equal to 144 square inches. "Your web site is delight to scroll through, confusing and funny at the same time, with a lot of info you wouldn't find at any "serious big corporate" web sites. Keep up the good work and good luck..."
Epoxies do not do well in direct sunlight (direct UV exposure). They will turn cloudy and yellow, lose their shine and perhaps even chalk. All epoxies, especially white and clear epoxies do this. Most do it rather quickly, within a few days of constant exposure. Some, like our very popular Bio Clear 810 do it very very slowly (weeks instead of days). 2) one or two coats of clear 2-part Acrylic Poly UV Plus will stop or stop UV yellowing of the epoxy. (More on UV blockers). Note: UV blockers cannot be added/blended into epoxies and nearly all non-epoxy clear coat products have little or no UV blockers in them. This options requires skill at spraying 2 part polys. For the average person - you'll get better results with the bio clear 810 without a UV blocking topcoat (keep covered when not in use if outdoors). The yellowing of 810 is really slow. The UV topcoats tend to show brush marks etc. which is a step down from the glassy smooth finish of the poured on Bio Clear 810. Yes, it is common to build up the thickness by doing a multiple layers of epoxy pours (generally because of the heat release on most epoxies). Our Bio Clear 810 (avail in 1.5 gal and 3 gal kits) can take pours up to almost 1/2 inch. "Paul, Finally got my top poured, your product is AWESOME. I was hesitant with all I read about go small first, my top was 8'x2'6"x1/4". I'm the "Go big or go home" guy, this top was my first pour & I feel that your product made it as easy as it could be. I was very surprised at the lack of fumes, I poured in a different location & could have just poured in the store where the counter is going." 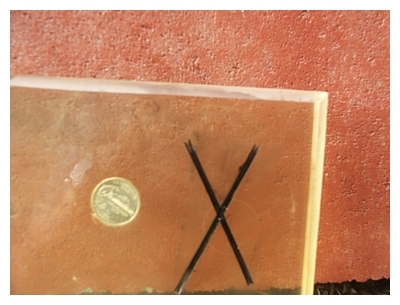 A block of Bio Clear 810 (tm) tabletop epoxy shown with router rounded edges, an embedded coin, and routed "X" filled in with black epoxy. is on the line. No 'bulk clear internet' epoxy for them! Actual Bio Clear 810 customer projects and examples --- www.epoxyproducts.com/bartop2.html . The surface to be coated is often sealed with some other product prior to pouring the epoxy. This is necessary when pouring over old lumber etc. Also many of the objects to be covered with epoxy need to be sealed to prevent air (and bubbles) from coming out of them. Generally people use a clear polyurethane from the hardware store, or marine spar varnish, or even glue. When sealing old wood, seal with at least 2 coats of sealer (as per customer feedback - one coat may not be enough). Sealing prevents leaks, bubbles, and show possible bad stuff, like grease or oil that will mess up the epoxy pour. 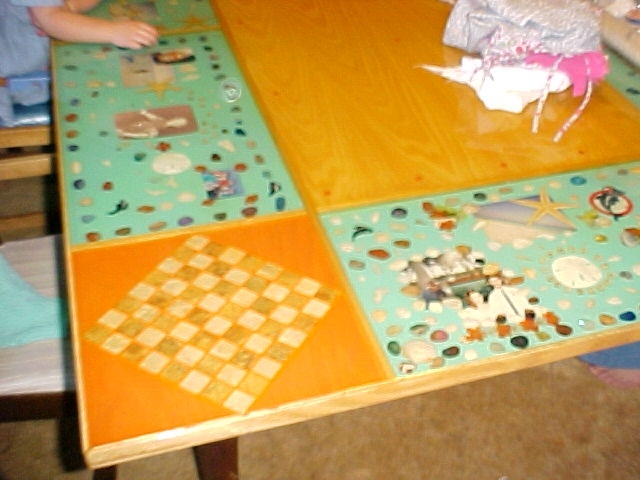 It an also glue down objects to be placed in the epoxy. Easier to fix before the epoxy is poured (may not be able to fix after the epoxy is poured). So... two coats of clear sealer recommended - let dry for several days or longer. TEST the epoxy on your surface. Some surfaces will release a lot of air bubbles. Cheap inks may bleed. Unknown or unsuspected contaminants on the surface may discolor the epoxy. Sudden changes in temperature or humidity may affect the epoxy. Make sure your raised edges or sills are leak proof and level. Once poured, it is almost impossible to stop an epoxy leak in a corner. Bio-Clear 810 cannot be brushed on. It must be poured at sufficient depth to prevent surface tension related fisheyes. The epoxy will feel dry and hard overnight, but it takes a week for it to fully cure and harden. Do not place objects on the epoxy before then as they will stick or leave a dent or impression in the still hardening epoxy. Mixing: even a slightly less then perfect mixing can ruin a table pour and Murphy's Law seems to always apply. First make sure parts A and B are clear (part A and/or by may have a slight yellow or amber tint, this will not be visible in your pour). Now, mix up batches no larger than 1.5 gallons at a time. Larger batches can be harder to mix well, are more likely to spill, etc. Mix in a separate, large, third container. Pouring into and out of this third container aids mixing. Using a large container will mean you can mix without concern of it spilling out over the top. Not mixing well vertically (mixing the top and bottom layers) is a disappointment waiting to happen! Don't try to get the last few drops of epoxy out of your mixing container. The liquid sticking to the sides and corners/edges of the container never get completely mixed. Pour your mixture out of the mixing container but don't keep it draining out for more than 10 seconds or so. Poorly mixed epoxy will always stay tacky or wet, either in certain areas or all over. Even better is to double mix. Mix in one container. Pour into a second container and mix again. Use the double mixed epoxy from the second container on your surface. Finally, the epoxy will feel dry and firm overnight but will continue hardening for a week or so. Don't place papers or objects on the epoxy for at least several days or they will stick or leave a dent. YOU CAN SAND OUT FLAWS ETC. THE CLOUDY SURFACE THAT RESULTS CAN BE MADE CLEAR AGAIN WITH A CLEAR TOPCOAT OF JUST ABOUT ANYTHING (NOTE THAT THE 810 EPOXY CANNOT BE APPLIED THINLY - IT WILL FISHEYE) - YOU MIGHT EVEN TRY CLEAR NAIL POLISH. 1) The epoxy leaks out from the corners FIX seal the edges and corners (using some of the epoxy, varnish, etc.). Test (with water) before your big pour. 2) Bubbles in the epoxy - either from mixing too vigorously (you're not making whip cream!) or from the wood/objects you are covering with the epoxy. Sealing the surface prior to the pour will take care of the bubbles from objects in the epoxy. To remove bubbles quickly pass a torch/heat gun over the surface of the epoxy once the bubbles have reached the surface of the epoxy. 3) Stress cracks. On large pours (say over 3 or 4 gallons, or maybe greater than 15 or 16 square feet) - stress cracks can form from all the different temperatures generated. The bigger the pour the thinner each layer of epoxy has to be to 'handle' all the heat. I wish I could be more exact here, but I have no 'real' numbers to offer. I have found that running a fan across the poured epoxy helps to dissipate and even-out the heat generated permitting thicker and larger pours. 4) Ridges and an uneven surface. Just like the stress cracks, this is a result of too much epoxy (too thick) applied at one time. The unevenness is from the heat generated (unevenly) in the pour. imported, low end, epoxy offered by the competition. for thinner look and lower cost. New to pour on epoxy projects? Best approach is to order our 48 oz Bio Clear 810 sample kit. Get past the learning curve and gain some experience up front. Don't tackle your Big Project with products you have no experience using - too risky! This product is featured on the GreatThings4u.com website. CLICK HERE to see these products in our online catalog (special purpose epoxies section). Click here for the latest "how to instructions and comments" formatted as a PDF file for easy downloading/printing..
-- Paul, Thanks for all your advice, tips & moral support concerning my project. It turned out beautiful. Quality people backing a quality product is the only way to go! Sincerely, Joe Laissez les Bon Temps Rouler!! 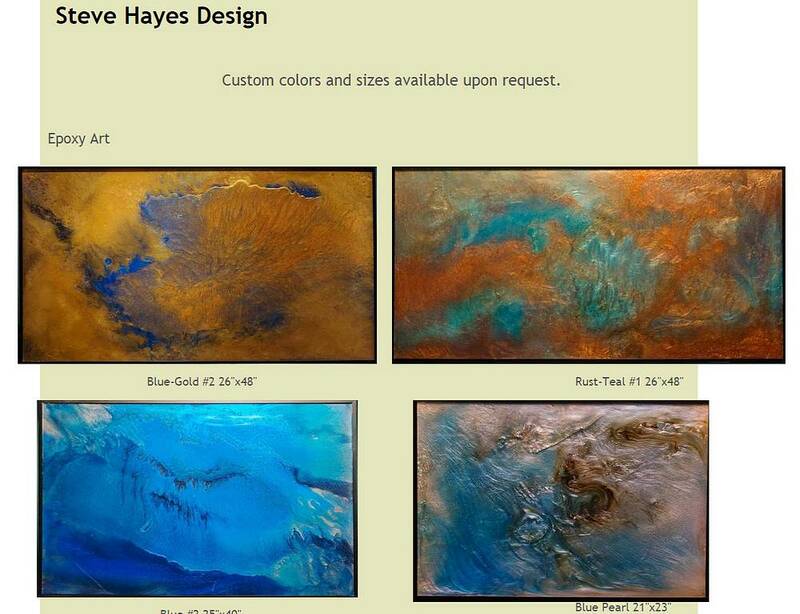 You can hire Steven Hayes to design your custom epoxy wall art or epoxy table top surface. "OK...thanks for the personal touch. And for such an informative website. The navigation took me a while to grasp, but I really appreciate all the credible, helpful information you provide. This is my 3rd or 4th order over the years and I give you a A or A+ grade on all of it. Paul - You Rock.!! I know your going through some rough times; but your products, your site, has a Big impact on many of us 'little guys' out there. Keep the faith, you are providing a very valuable, service & advice. Your products allow our family to enjoy times in parts of the house that they normally wouldn't - and provide Great bonding time, when the kids decide to hang out with dad, in 'his' area.!!! It is thanks to YOU, and Your products, your support, that we are able to do this. Thank YOU, Very Much. We'll send those photos, of our old place, and when this is done, the new one. You provide outstanding products, and Fantastic Support. Thank You. LEGAL NOTICE: By visiting this web site you agree that the laws of the state of New Hampshire, without regard to principles of conflict of laws, will govern these terms and conditions and any dispute of any sort that might arise. Any dispute relating in any way to your visit to this site or to products you purchase through epoxyoutlet.com shall be submitted to confidential arbitration in Pittsfield, New Hampshire, except that, to the extent you have in any manner violated or threatened to violate our intellectual property rights, we may seek injunctive or other appropriate relief in any state or federal court in the state of New Hampshire, and you consent to exclusive jurisdiction and venue in such courts. Arbitration under this agreement shall be conducted under the rules then prevailing of the American Arbitration Association. The arbitrator's award shall be binding and may be entered as a judgment in any court of competent jurisdiction.